I came into the shop this past week with all intentions to finish construction on the secretary I’ve been working on forever. I have developed numerous secret compartments for this piece – I plan to share these via video next week on this blog. I could not, however, pass on the opportunity to include a couple more secrets as I wrapped up the build. I have never seen secret compartments built into desk lid supports, or lopers as they are called by some. I challenged myself to make it happen. At first I searched for a small something that I could slip into place, but when I came up empty I became creative and borrowed an idea from Roy Underhill’s grease pot (built and posted by The Village Carpenter. See it here.) My idea was simple and it worked. First, at the rear of the loper, mark the area that will become your lid as shown in the photo. I used my dovetail layout jig to make a slight angle on the top face, then connected the lines to create the 1/4″ lid. A light scribeline helps start and guide your saw. I used a Japanese small rip Dozuki from Lee Valley & Veritas because it had the thinnest blade of all the saws I have in the shop and a thin cut is less likely to be noticed. With my top cut free, I drilled a 3/4″-diameter hole into my 1″ wide supports, but any size hole works. My drill press made sure the hole stayed true without peeking out one side or the other. The key here is to drill deep enough to hold whatever you think might be stored in this compartment – I suspect rolls of cash. You do not, however, want to drill completely through the loper – not much of a compartment if your goods fall out the bottom. All that is left is to reattach the lid. Mark the lid for your screw and make sure there is enough swing in the lid and that your lid clears the compartment when it’s fully open. (My screws were centered at 3/8″ from the ends while the holes were drilled 1 1/4″ from the ends.) The screws I used are perfect for this job because the threads stop before the screw head. This allows the lid to pivot on the screw shaft without catching any threads. 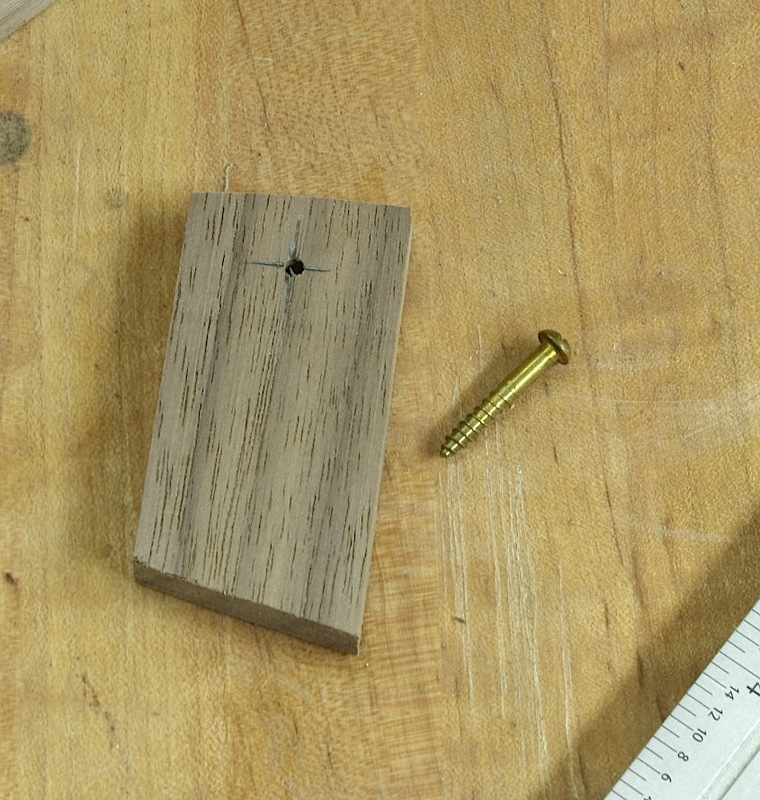 Hold the lid in place as you drill a pilot hole for your screws. Install your screws and the job is done. Tension holds the lid closed until you unveil the secret. Below is a short video that shows how you access and use these compartments. Ever heard of powdered shellac? I hadn’t until Saturday when I presented a day long seminar on finishing for the Michigan Woodworkers’ Guild. As I talked about aniline dye, shellac and lacquer, there were a few questions asked and more than a few great ideas and techniques tossed about. With 90 woodworkers sitting in a group discussing finishes and finishing, you know there is going to be a lot of interesting information discussed. I’m the guy they asked to speak and I hope attendees picked up something during the day that makes them better woodworkers and finishers. I seldom participate in an event such as this without gaining knowledge or a tip of some kind to make me better at what I do. This seminar was no different. During our discussion about shellac, Ed Stuckey (see some of his work here), brought up powdered shellac. As he explained (and I intend to discover for myself), you add powdered shellac to your project so the powder settles into the grain. 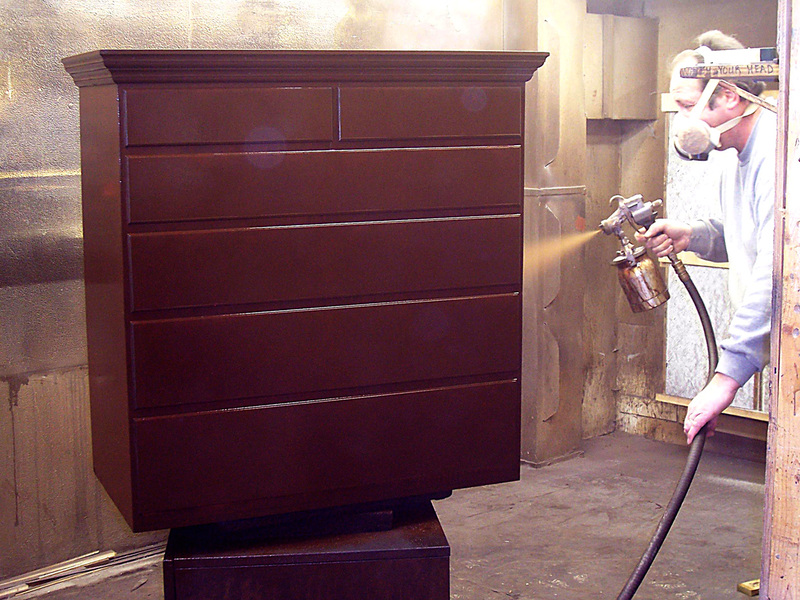 As you add another layer of liquid shellac, the powder is redissolved to help fill pores. This technique would certainly be faster in filling grain than multiple coatings of shellac where you sand the surface back to knock any shellac peaks into the shellac valleys. 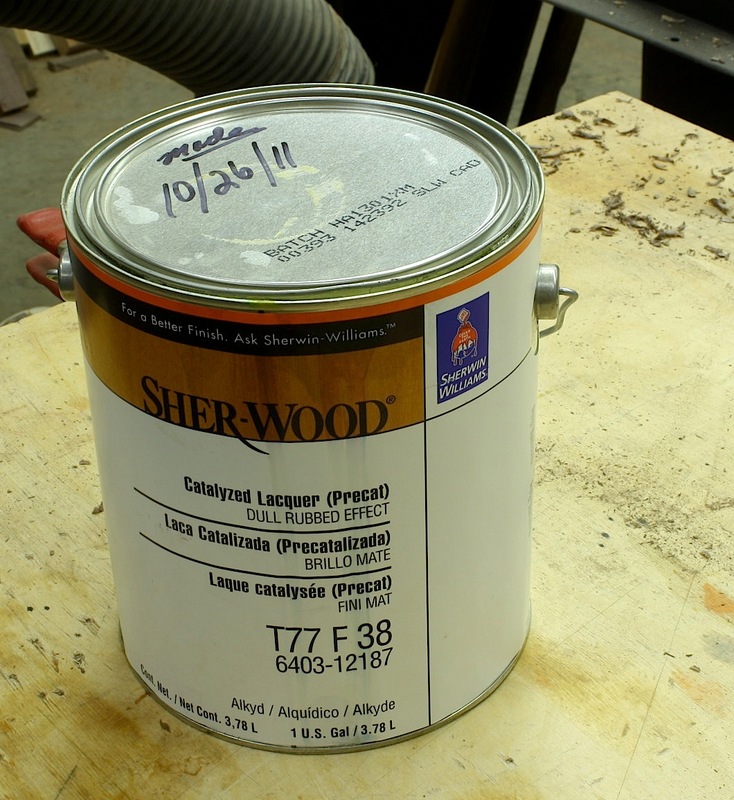 I am curious if it’s possible to use pulverized shellac flakes in the same way, or is there something altogether different about powdered shellac. I think this is worth a closer look. Thanks, Ed. To see a listing that I found on Ebay, click here. Before leaving for Michigan, I wrapped up an article for The Finishing Store which is the online store for Apollo Sprayers International Inc. 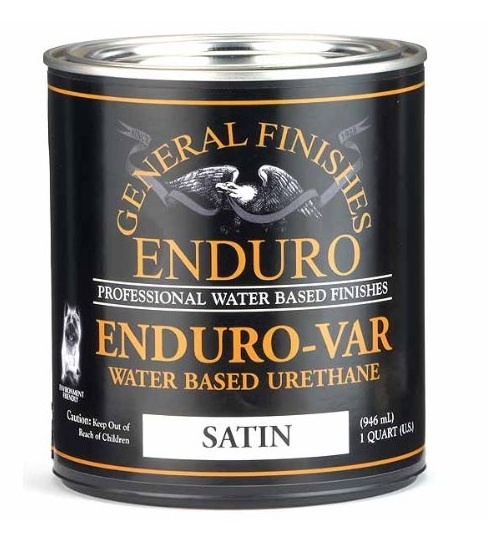 The Finishing Store publishes a monthly newsletter. 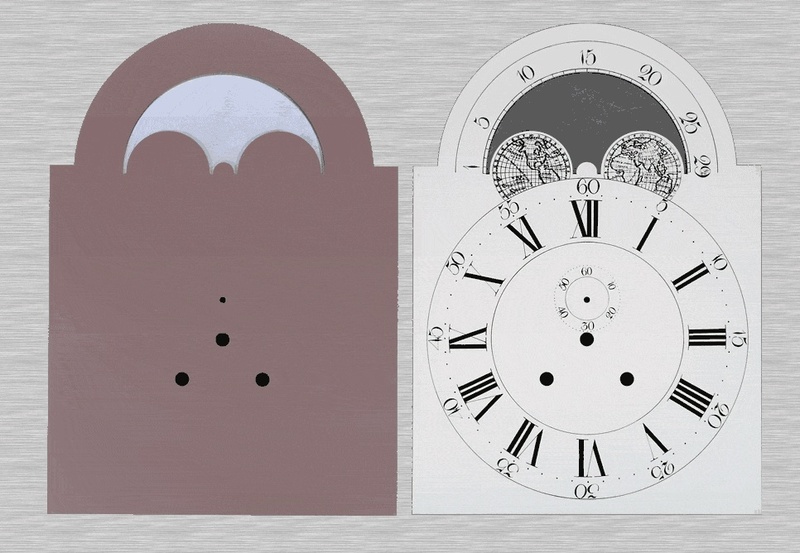 My piece for this next issue discusses how to finish projects without muting, masking or otherwise destroying inlay. My last article was on glaze. Here is a link to that issue (click here). Be sure to check out other newsletters – finish guru, Bob Flexner, writes for each newsletter – as they are all available on the site. I received a bag of shellac flour – the texture is very similar to baking flour – from Mr. Williams with which to experiment. As I become more enlightened, I will add more to this update. 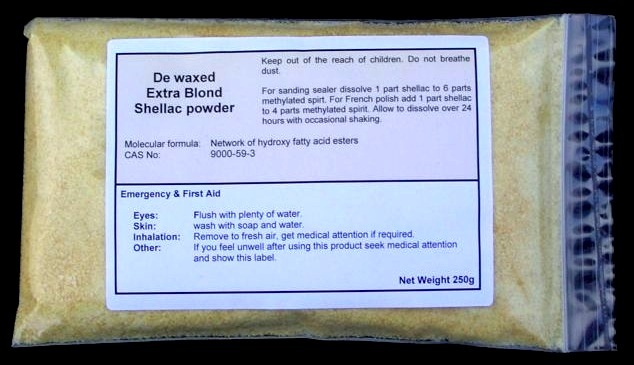 If you would like to pick up some of shellac flour to try in your shop, contact Don Williams at artisan_dcw@msn.com. Editor’s note – last week on Sunday as I prepared my blog, my computer crapped out. A new hard drive was installed this week. Of course, all my files were lost. (No, I didn’t have a back up! Lesson learned) My apologies if you stopped by to nothing new. When you study desk interiors, one of the interesting aspects is the varied shapes. Undulating curves make the interiors more appealing – that and the many compartments and small drawers. Combined, these two attributes bring about curious curves that lead to a dovetailing puzzle. Take a look at the lower drawer in the opening photo. The end of the drawer front toward the side of the desk is straight up. 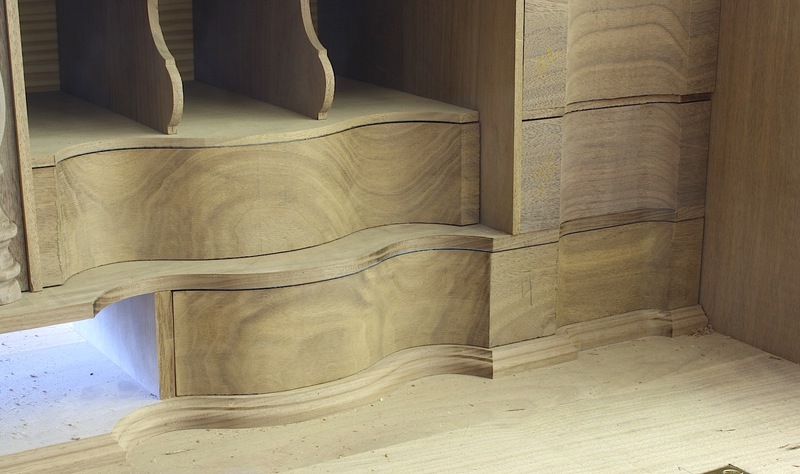 There is no mystery in these dovetails due to the square end. However, the opposite end of the drawer front is more complex. 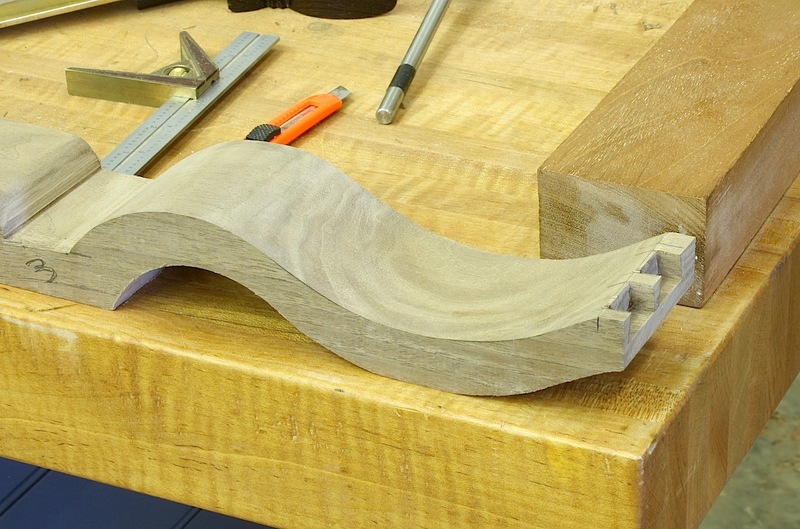 As shown to the right, curves cause the front to bend off the bench top as the front sits flat. 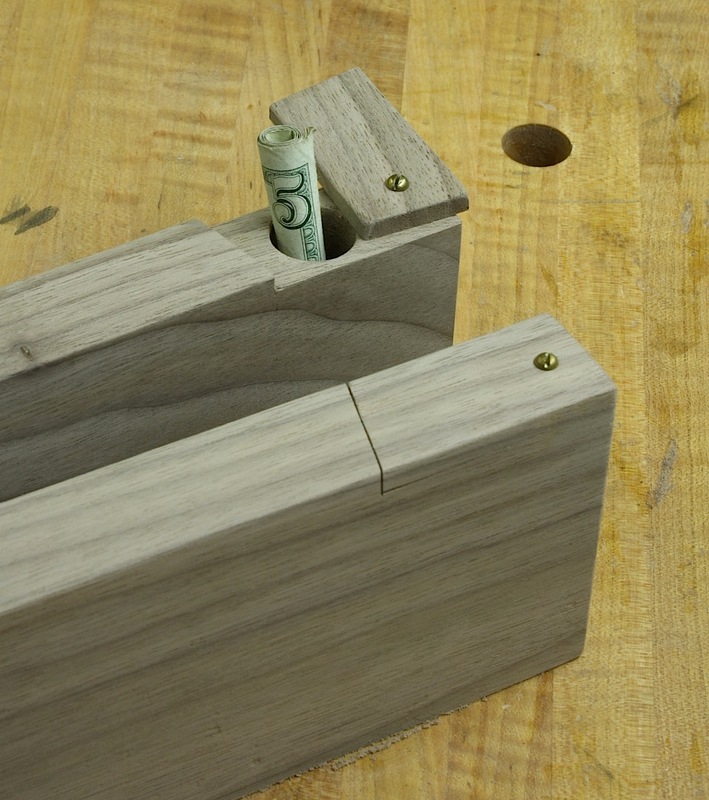 It would be nearly impossible to chop dovetail sockets into this piece without building support under the edge. You would splinter or break the drawer front as you pound out waste. And support is difficult because there is no flat surface at the edge to rest against. What to do. 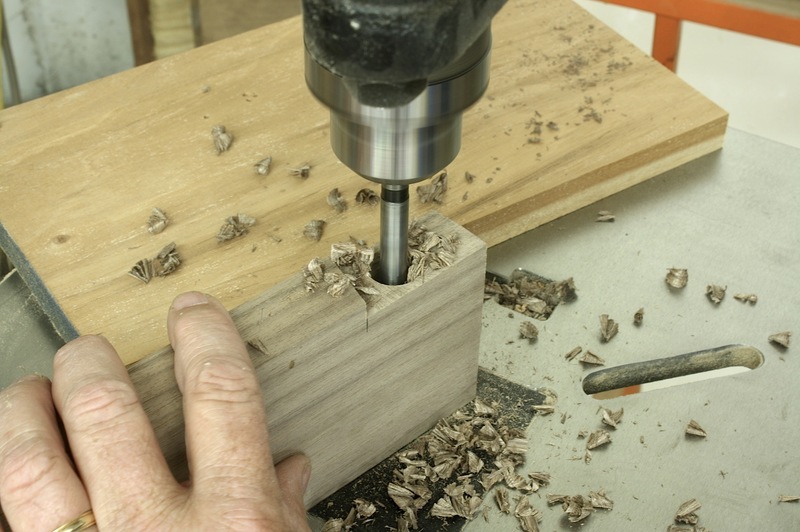 This is where it’s best to add a little power to your hand work and bring out a trim router. 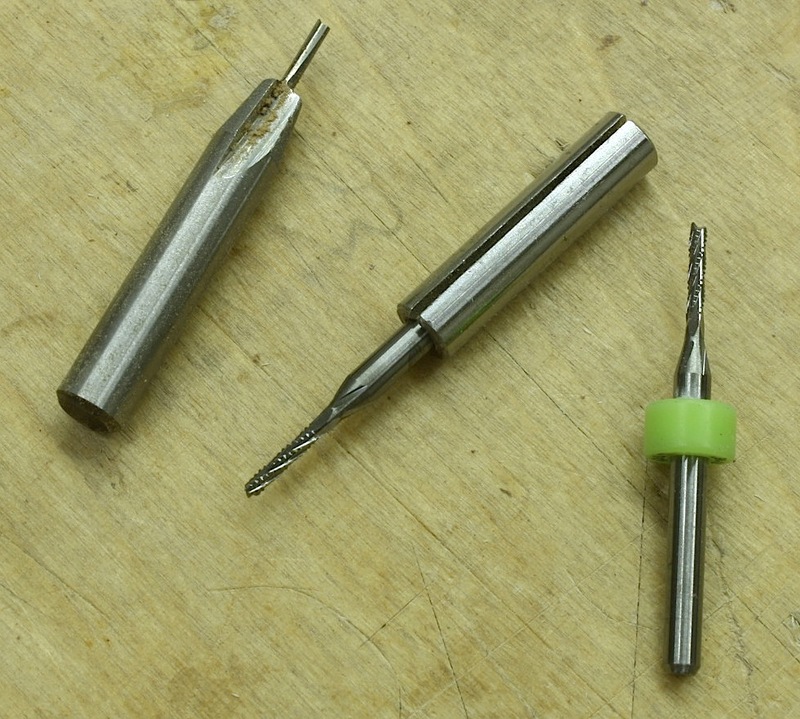 With a small diameter router bit loaded, you nibble away the waste to clear your socket, then it’s back to chisels to clean the socket and true up its sides. The obvious concern is how to balance a router on the drawer front’s edge as you hog out waste. When routing waste on flat panels simply clamp a scrap along the back of your workpiece just even with the edge. The added thickness provides support for your router as you work. (To see this setup and how it works, check out this video, click here.) Here again the curved front presents a problem because there is no surface to which to clamp. This is where you need to put on a thinking cap. 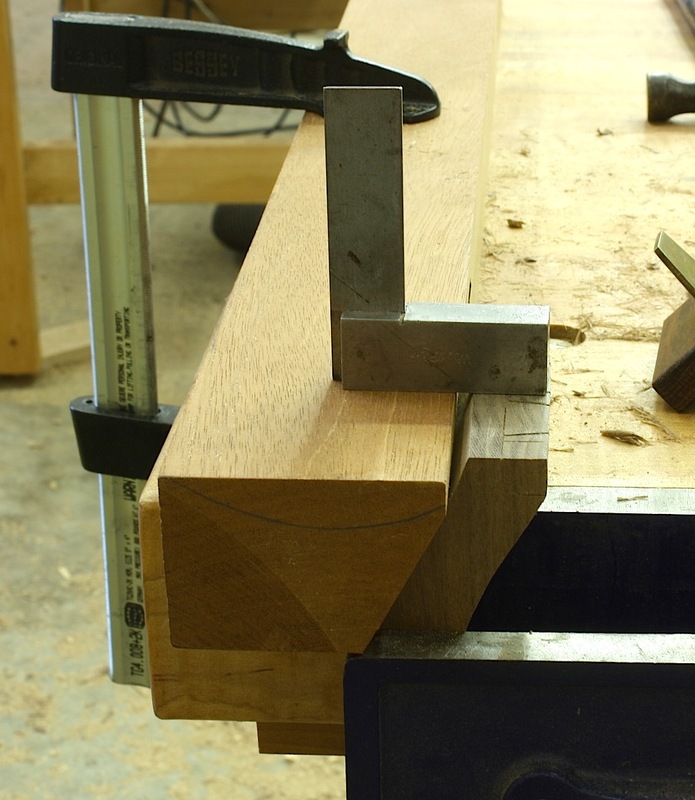 Cut a bevel into an 8/4 piece of stock – a 4/4 scrap would have worked just as well – so the bevel cut somewhat matches the drawer front bend as the workpiece was clamped into a bench vise. Position the scrap so it extends over the vise, then clamp the scrap to the bench. Use a small square to set the drawer front flush to the top edge of the scrap and level with the scrap as shown in the photo. 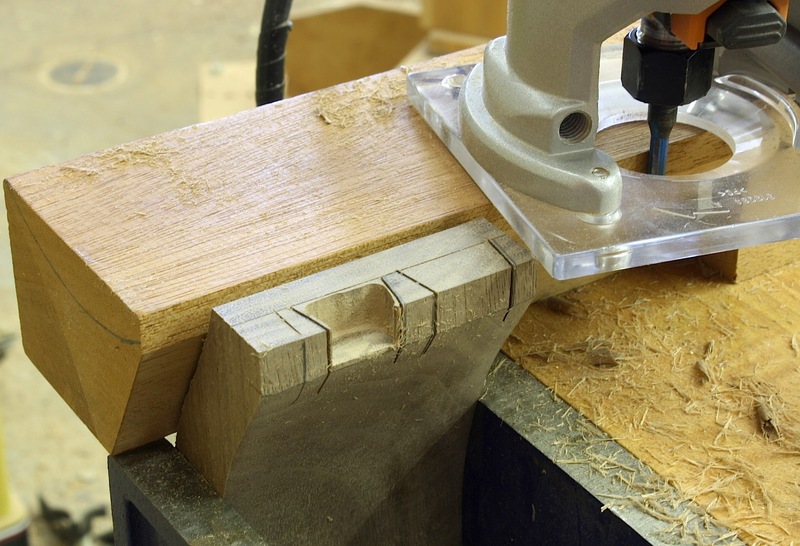 With this setup, the scrap provides support for a trim router as waste is routed from the sockets. 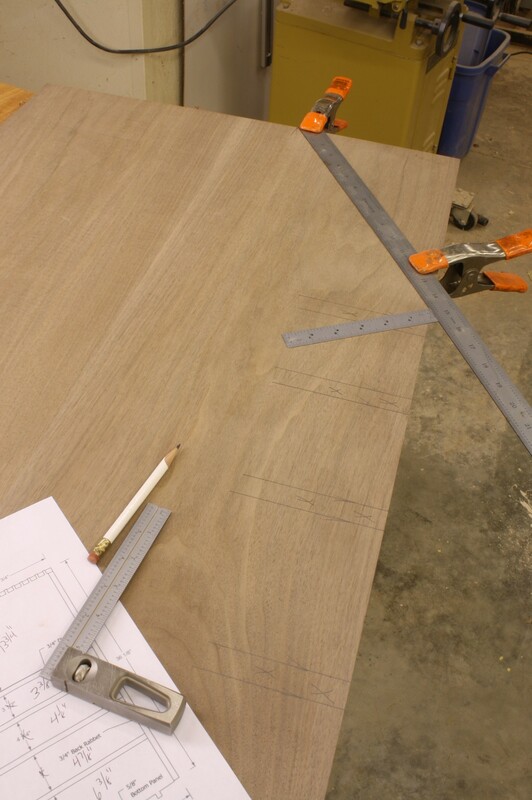 Before I began any routing I scribed my base line, laid out my socket areas, then cut the sides with my dovetail saw. This defines the sockets and provides a bumper when you route as you do not want to nick the sides of your sockets. Also, remember to set the depth of cut on your router. 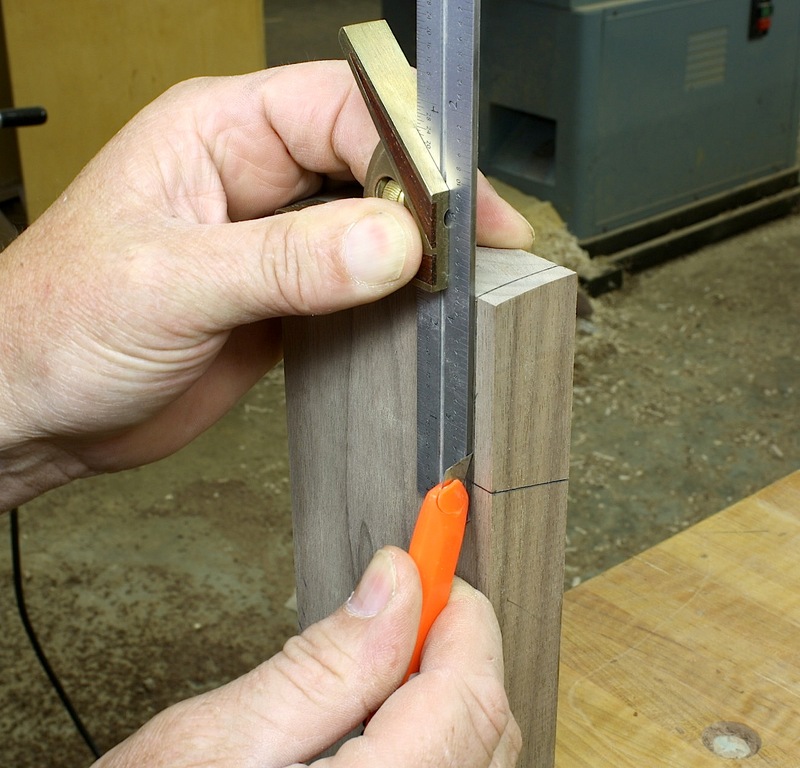 Trim away most of the excess as shown in the photo below, then use chisels to pare your sockets to finished shape.